" Genealogy - James Firman Kelly - Edward Walthall - W. S. Tatum - I. N. Rainey - 15th Mississippi Regiment - Darlington, South Carolina - Coffeeville, Mississippi - Shiloh, Tennessee - Greensboro, North Carolina. 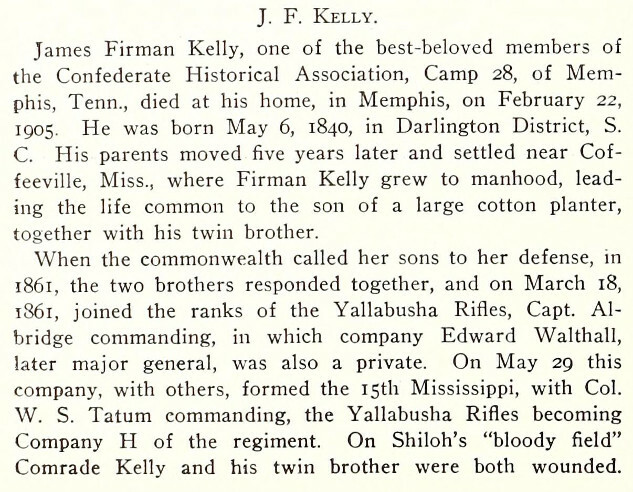 Obituary of James Firman Kelly, Memphis, Tennessee. SOURCE: Confederate Veteran Magazine, June, 1905.